The extraordinary story begins in Philadelphia, where Grace’s father, Jack Kelly, an Olympic athlete and local hero, often shunned his shy and sickly daughter. Grace was determined to win the attention of her father and the world. While carefully cultivating the image of the white-gloved young lady, she became a surprisingly brazen, even reckless, young woman. Grace’s joy at her wedding to Rainier and her disenchantment with her cloistered palace life are recounted, the depth of Grace’s hurt caused by her husband’s autocratic treatment of her revealed. The princess soon found herself living a separate life from Rainier in Paris. To her public, however, Grace always maintained the image of Her Serene Highness, the adored princess who had achieved perfect happiness and who kept up the hard work at her official and charitable duties. 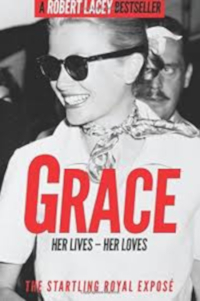 Reissued in 2014, by Apostrophe Press, the The digital edition of Grace includes an embedded video, a link to a collection of more than 100 photos on Apostrophe’s website, links to the trailers of all 12 of Grace Kelly’s movies and links to nearly an hour’s worth of British Pathé newsreel footage. First published by Macmillan (UK) in 1995. Reissued as an e-book by Apostrophe Press (UK/US) in 2014. “Kelly was a living legend, but Lacey makes her real without really diminishing her effect and effectiveness… Lacey does more than recite known facts. He digs deeper, and his picture is one far more realistic than the impossibly wholesome depiction than Holywood wanted us to accept”.